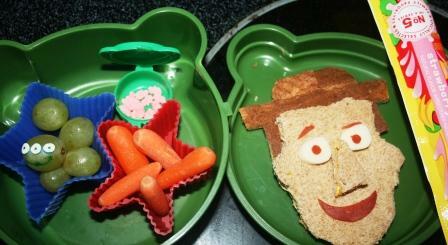 The sandwich Woody is amazing :) Very creative Lisa! You have just talent! Your Woody sandwich is amazing! I bet Pierce loved it. I can see why he was so excited about that. It's so cute! That Woody is a work of lunchbox art! What a great job you did on Woody, Lisa.... that is GREAT!! Any kid would want to eat him. That is too stinkin' cute! Great job! ...love that movie! This is so great Lisa that I had to tweet it. Here is the link if you want to retweet. Wow- Woody is impressive--- but I think the alien grape is my favorite- what fun!! So cute! Liv and I love it! You are the queen of lunches. This is awesome. You've outdone yourself this time. Woody ia amazing!!! That is outstanding. Sorry about my blog. Thanks for pointing out my mistakes in setup buttons too. Sometimes it helps to have another set of eyes. Lucky,lucky Pierce to have such a clever mummy. Now that is just too cute Lisa! I love it! I do have a question about it. I'm always wondering with the bentos that people make and send to school how do they keep them to stay in place? I think it would be hard to pack it to keep it all together. Awesome, Lisa. You did GREAT with that sandwich. It's no wonder that Pierce was so excited....I always enjoy seeing what you do on Muffin Tin Monday. Wow, aren't you the mom of the year! LOVE this cute lunch idea. What creativity. Your kids are sure blessed to have you for a mom! Holy cow Lisa! You out did yourself this time. How incredibly cute and creative. This is the most artistic I have seen you do yet!!! It is amazing how you make the face so realistic, and I love the tiny three eyed alien!!! Oh sweet Lisa, that Woody is too stinkin' cute. I want a Wood cheese sandwich!!! Your little man is truly blessed to call ya Mama! What a cute creative lunch! I love it! Wow that is a very creative lunch! Hooray! A sandwich with me on it!! Funch! You got talent mom. I wish my lunches came in some cute little containers too! Wow, you have totally outdone yourself this time! The Woody is so impressive and I love the little grape LGM! Pierce must be the envy of the whole classroom! I just getexcited seeing what you're going to come up with myself! Perfect food for a Bear waiting to go into hibernation. Speaking of that, is it cool enough for you Bears to start hibernating? It has been dreadfully warm up here. We finally got some snow and cooler weather — that's -28C, or -18 F.
It's all good, but I LOVE the alien grape! So cool!! Awesome lunch! My daughter is really into Toy Story and would LOVE this! Great job! I love how you used the crust for the hat! I would have never though of that! So cute!!! I love everything you do, but this is incredible. Soooo fun!! Okay, seriously?!? That Woody is amazing!!! You are a genius sandwich artist!! !